Food storage often takes a backseat to the more obvious areas of the home in need of organization. Bathroom cabinets, walk-in closets and garages are often given priority over the pantry because they typically hold a more eclectic mix of items, so keeping things properly stowed is necessary. However, a systematized pantry fit for a chef eases food prep and puts the bow on top of a well-organized home. With spring in full swing, it’s time to tackle the kitchen pantry and make canned food, paper products and small appliances easier to spot. Unlike what you have stored in your refrigerator, food in the pantry doesn’t get a strong smell after it goes bad. It’s easy for things to get pushed to the back and forgotten, maybe even a year or two after the best use date. Rid the pantry of all expired items and start taking inventory of good products to donate – think canned items, dried pastas and extra spices taking up too much room. No two pantries look alike, mostly because every homeowner and renter has personal preferences based on cooking and dietary needs. Draft up an organizational layout based on how you cook. Purchase racks and shelves to house foodstuffs for where they will eventually live in the space. Stack small, lesser-used appliances like waffle irons and juicers on the top shelf. If space allows, place a small stepladder inside the pantry to provide easy access rather than impact the design of your kitchen. 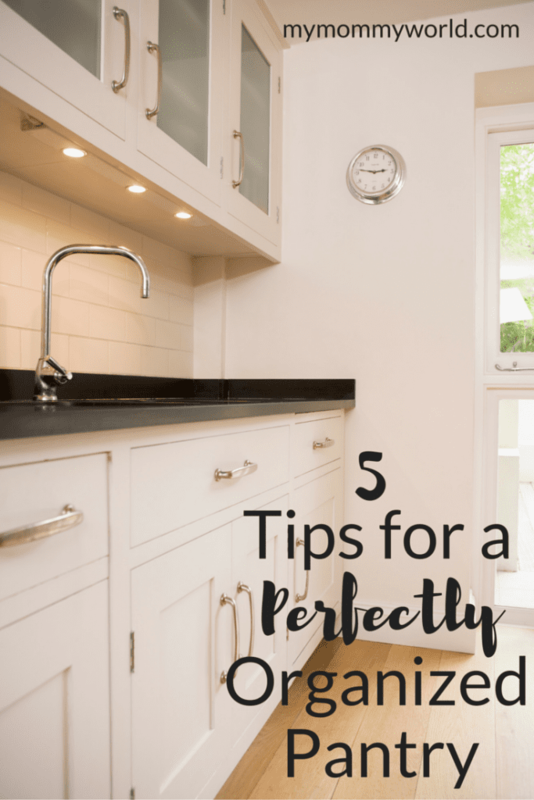 Mixing boxes and bags on gorgeous open shelving or even inside cabinets can be a mess for homeowners, especially with cereals and pastas you buy in mass quantities. Instead, use clear, refillable containers with labels for an aesthetically-pleasing look. A less cluttered appearance will help remind you to stay organized throughout the space, and the larger containers are perfect for storing baking goods like flour and sugar. Hanging some of your cleaning products, especially on the back of the pantry door, is a great way to maximize unused square footage. Purchase hanging wire shelves for cleaning supplies like spray bottles, soaps and paper towels. Get creative with your pantry design, and don’t forget about the intention of the space – extra storage. Even if you think you know your pantry like the back of your hand, there are probably a few items you forget about over time. To avoid having to perform a mass purge again next spring, keep similar items grouped together. Put coffee and creamer with sweeteners; store flour, sugar and baking soda near each other; and, place pastas, grains and oats on the same shelf. Remember, the pantry is a part of your home. If the budget allows, adding some fun flair like wallpaper could be beneficial at resale. You eat three times a day, why not make your food storage both functional and attractive? Such great tips. I know I try to keep my pantry nice and tidy so I know what I have on hand.